The joint resolution was signed by the policy boards of the Ark-Tex, East Texas, and Deep East Texas Rural Planning Organizations and represents the first formal cooperative action of the thirty five (35) county East Texas Coalition. Harrison County Judge Hugh Taylor chairs the working group and is an Alliance for I-69 Texas board member. He is leading the effort to obtain funding for the next stage of route planning -- the environmental clearance process. That process will included investigating the options identified by the Working Group and looking at ways to mitigate impacts which increasing transportation efficiency. "East Texas Coalition members have all said for the first time that this is a project we want to endorse because it benefits us all," said ETCOG Executive Director, David Cleveland. "This collaborative effort enhances the economic development and creation of jobs in each of the regions." Judge Taylor said, "Because of this coalition, we now have a mechanism to collectively get behind projects that benefit multiple regions. This is an excellent example of what elected officials from different regions can accomplish when we all work together. We need more teamwork like this in the future." The East Texas Coalition was initially endorsed by the ETCOG Executive Committee by resolution in December of 2010 and subsequently endorsed by the East Texas Chief Elected Officials Board in April of 2011. The overall aim of the coalition is to take rural transportation planning to the next level by coordinating and collaborating on interregional projects. The joint resolution states that the three RPOs, under the umbrella of the East Texas Coalition, will coordinate actions to provide coordinated and prioritized transportation planning for the entire thirty-five county northeast Texas area. 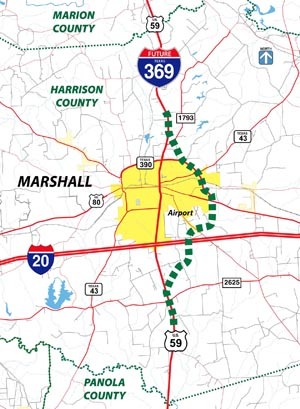 They will support locally determined route options for the I-69/I369 route through Harrison County and the City of Marshall while supporting the mission and goals of the Texas Department of Transportation (TxDOT) by enhancing safety, addressing congestion, and connecting the communities. The Harrison County working group has identified a route around the east side of Marshall that they feel will best serve the region. Flowing south on US 59, the proposed route would incorporate a section of Loop 390 before swinging south of the Marshall Airport before crossing Interstate 20 and winding back to the existing US 59 alignment south of the city (see map at right). A decision was made in 2013 that the section of the I-69 system from Texarkana to Tenaha on US 59, including Harrison County, will be numbered as Interstate 369. The first section in Texarkana was signed as I-369 and added to the Interstate Highway System in 2013. The Texas Transportation Commission received a briefing on the I-69/I-369 Marshall Route Study in December 2014. The next steps in the project will be for TxDOT to identify funding sources and complete the environmental and schematic design process. During that process more data will be gathered, more public involvement will occur, and further refinements will likely be made to reduce effects to residential properties, commercial properties, and environmental features. This is the conceptual route that became the consensus recommentation of a citizen-led Working Group.